Two interested buyers of the shuttered Newberg paper mill report getting the cold shoulder from the Georgia-based owner WestRock Co. more than a month after WestRock told this newspaper it is open to selling its property to another mill operator rather than demolishing its papermaking equipment and selling it as scrap metal. Oregon's recycling sector has high hopes that a closed Northwest mill can be restarted, using as feedstock the recycled paper that is collected at curbsides but now gathering dust or being buried in landfills since China stopped buying our scrap paper. 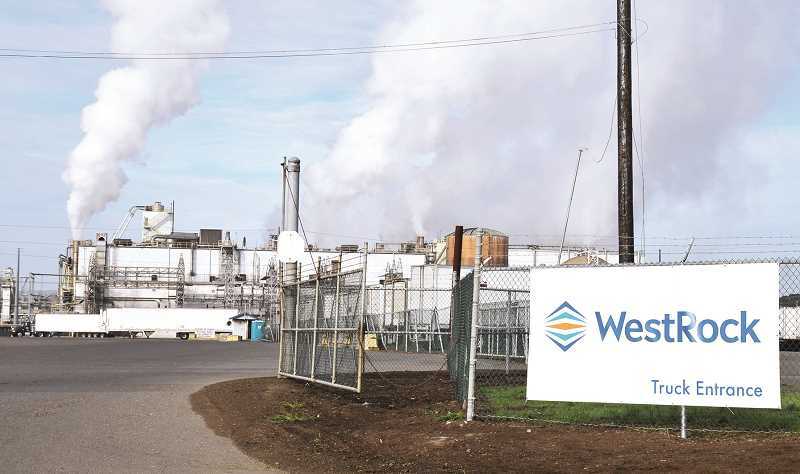 The Newberg mill was viewed as a prime candidate, until it was reported June 7 that WestRock had inked an $8.25 million contract to sell its property on condition that the papermaking equipment be destroyed. After that story appeared, WestRock corporate communications director John Pensec said that deal was dead and the company is now open to new offers, including selling to mill operators. Since then, Rahul Kejriwal, who works for his family's mill and textile company in India, and Mu Lin, whose father owns a papermaking company in China, have been rebuffed by WestRock after expressing eagerness to buy and restart the Newberg mill. Both say they would turn locally collected recycled paper into pulp to make new paper. "They've made absolutely no effort to reach out to Rahul and the Chinese company," said Greg Pallesen, president of the Association of Western Pulp and Paper Workers (AWPPW), the union that represents the more than 200 workers who were laid off at the Newberg mill. Kejriwal has tried to contact WestRock and offered to bring his financial people to Georgia, Pallesen reported. "In my opinion, they gave him a song and dance," he said. "He told them he would sign a non-compete agreement with them. They will not meet with him." Kejriwal declined an interview, but in an email wrote that he "had not gotten a clear, positive response from them yet." He handles acquisitions for Kejriwal Group International, which wants to supply more newsprint to the Indian newspaper industry. Unlike in the United States, newspapers are thriving in India, where literacy is growing and the infrastructure to read news online lags behind much of the world. Mu Lin, a Reed College graduate whose father owns Forest Packing Group in Zhejiang, China, said the response he got from WestRock was "pretty cold." "I don't think WestRock is exactly looking for a purchaser," he said in an email. He added that his company could invest $100 million to $200 million to restart the Newberg project, including funds for new equipment and to secure permits, and still make a profit. WestRock bought the Newberg mill in 2015 and quickly closed it down, along with a second mill that was part of the deal. Pallesen said that appeared part of a national trend in the paper industry of reducing the supply to drive up the price. "In the instant they announced the closures, their stock went up and the price of the product they were making went up," he said in June. Pensec declined requests for an interview on the mill's status, but did submit a brief statement via email. "The status remains the same from when we last spoke, which is that we are assessing the best use of the Newberg facility," he wrote. "We will take some time to determine the next steps and do not have an identified time frame for any decision." Pensec's comments were similar to what WestRock said in an email to Mu Lin and to the remarks of WestRock CEO Steve Voorhees in an Aug. 2 conference call with stock analysts. According to a transcript of the conference call, Goldman Sachs analyst Brian Maguire asked Voorhees about the empty Newberg mill, noting recent publicity and the role it might play in "potentially being a solution to China's ban on mixed paper." Maguire noted there's renewed interest by Chinese investors in buying United States mills and asked if WestRock might re-evaluate its plans and restart the mill or seek some new partnership to reopen it. Voorhees responded that his company is "now assessing the best use of the Newberg facility. It's going to take some time for us to determine the next steps, and we don't have an identified time frame to make that decision." It could be that WestRock is simply taking its time before considering purchase offers. Pallesen said no other parties have shown interest in buying the mill. Pallesen suspects WestRock is biding its time while the U.S. Federal Trade Commission weighs WestRock's bid to buy Kapstone Paper and Packaging Co. The AWPPW submitted a complaint this spring to the antitrust division of the U.S. Department of Justice, arguing that WestRock's then-pending sale of the Newberg mill to a scrapper indicated it wanted to reduce competition. While WestRock's acquisition is under review, the union figures it has some leverage. U.S. Sen. Ron Wyden recently entered the fray on behalf of the union, sending a strong letter July 24 to the Department of Justice and Federal Trade Commission, citing WestRock's "troubling" behavior at a time when the recycling sector is in crisis. Recycling industry expert Jerry Powell, editor and publisher of Portland-based Resource Recycling Inc., said recently that if a market isn't found to use Oregon's recycled paper scraps, it could "destroy curbside recycling." Paper accounts for an estimated 60 percent of what Oregonians put in their recycling bins. China's ban on accepting mixed paper scrap has caused a shortage of pulp there to make paper, and driven up the potential profit of a reopened Newberg mill. So has the steep tariff on Canadian exports of paper to the United States that the Trump administration imposed, though it's unclear how much of that tariff ultimately will remain. One paper industry source active in world markets said the cost of labor accounts for 7 to 8 percent of mill costs here, and the price for raw material to make paper is several times that. But with some Oregon solid waste authorities literally paying to get rid of their recycled paper scraps by burying it in landfills, that makes the price of raw material for a would-be paper mill in Newberg unusually attractive.